Arrive at Ahmedabad airport/railway station and you are transferred to hotel. Check in the hotel and relax for some time. Later proceed to sightseeing of Ahmedabad which covers Gandhi Ashram, Vaishno Devi Temple and Iskcon Temple. Visit Akshardham Temple and enjoy the Pradarshani at Akshar Hall followed by the Grand Laser show at Akshardham Temple Premises.. In evening back to hotel. Overnight stay at the hotel. After Breakfast check out the hotel and you are transferred to Jamnagar then visit Bala Hanuman Temple Lakhota Museum, Lakhota Lake and other famous temples of Jamnagar. And you can also explore the local market in Jamnagar known for its Bandhni work. Overnight stay at the hotel. After Breakfast check out the hotel and visit Nageshwar Jyotirling Temple, Gopi, and take an exhilarating ferry /boat ride to the holy Island of Bet Dwarka , on your way back visit the Rukmini Temple. and you can also attend the Aarti at the Dwarkadheesh temple. Overnight stay at the hotel. Early in the morning attend the Aarti at Dwarka Dheesh Temple. then after breakfast proceed to Somnath enroute visit Porbandar-the Birth Place of Mahatma Gandhi. 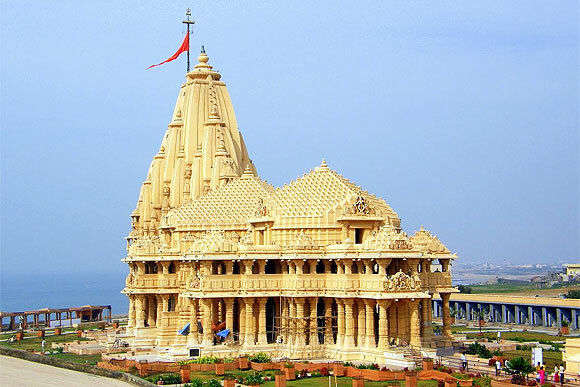 Arrive at Somnath visit Somnath Temple to attend the evening Aarti,or sound and light show Somnath Temple premises. Overnight stay at the hotel. After Breakfast visit world famous Gir National Park-The home of the Great Asiatic Lion. On arrival check in the Gir Birding Lodge. Later enjoy the Jungle Safari in Gir National Park to catch a glimpse of the Asiatic Lions, Leopards, Spotted Deers, and various species of Birds. In evening return back to the lodge. Overnight stay at the hotel. After Breakfast check out the hotel and you are transferred to Ahmedabad airport/railway station to board a flight or train for your onwards journey. X – mas and New Year supplement will be extra. If you have not decided yet or wants to customize tour itinerary or hotels listed above in "Explore Amazing Gujarat Tour Package By Make My Trip", then we can change the travel itinerary and make a personalized, tailor-made holiday package, especially for you. We can modify this travel package as per your itinerary, budget, duration and the tourist places you would like to visit, including transportation and airfare should be included or not. Please fill the form below to contact us.